Thin card strips (about one inch) are a good first cutting experience. Parallel and diagonal lines can be added to the strips for a new challenge once random snipping has been mastered. With older siblings to watch, the littlies are always very keen to cut. Rather than have them constantly nag me or try to grab those scissors and have a go on whatever is handy when I’m not looking, I prefer to spend some time and teach them to cut safely – under supervision! It is great for long stints of uninterrupted school time with older children while young ones are happily occupied on a purposeful and satisfying activity. The stiffness of straws makes them easy to hold and cut. 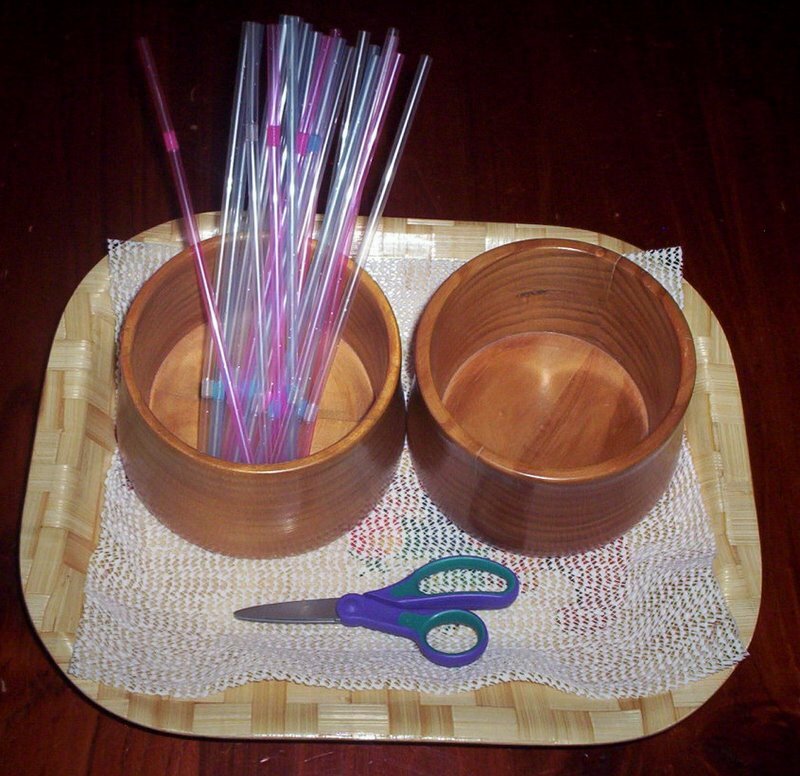 Cut straw pieces can be used for threading activities. A good pair of child-sized scissors is important. Make sure that they have a larger hole in one side of the handle so the all of the child’s fingers can fit inside, rather than the kind that have two equal sized small handle holes. (See the pair in the photo.) I also buy proper scissors straight away, rather than safety scissors, simply because of the frustration children feel when scissors are not sharp enough to cut well. The initial paper based cutting experiences outlined here would be fine with safety scissors, but once they move on to the straws and other materials they may not be sharp enough. Streamers are more difficult to cut because they do not stand stiffly out from the "holding hand." Cutting strips should be about one inch wide so that the child can cut completely through the strip in one snip. Sliding scissors forward and making a second snip to cut through paper is a more difficult skill and should be introduced later. Show your child which hole is for the thumb and check that they continue to hold the scissors correctly with the blades facing away from them. Young children tend to turn their hands around, rather than the object they are cutting, which causes them to end up in all sorts of interesting and uncomfortable positions. A new level of difficulty. 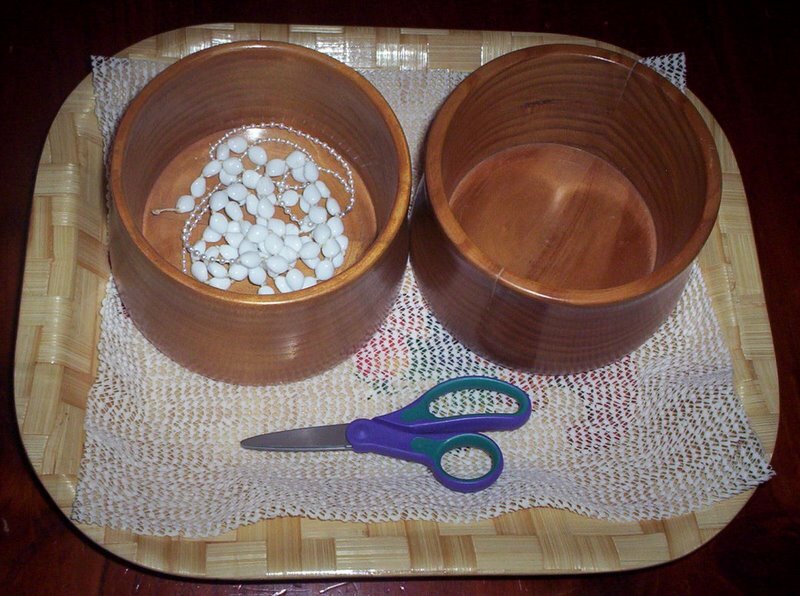 Use cut beads for various craft projects later. The first material to present is the easiest to cut – one inch strips of thin card stock. Regular paper is too thin and does not stand out stiffly from the child’s hand, flopping down and making it difficult to cut. Remind your child to keep moving their holding hand away from the scissors as they go. 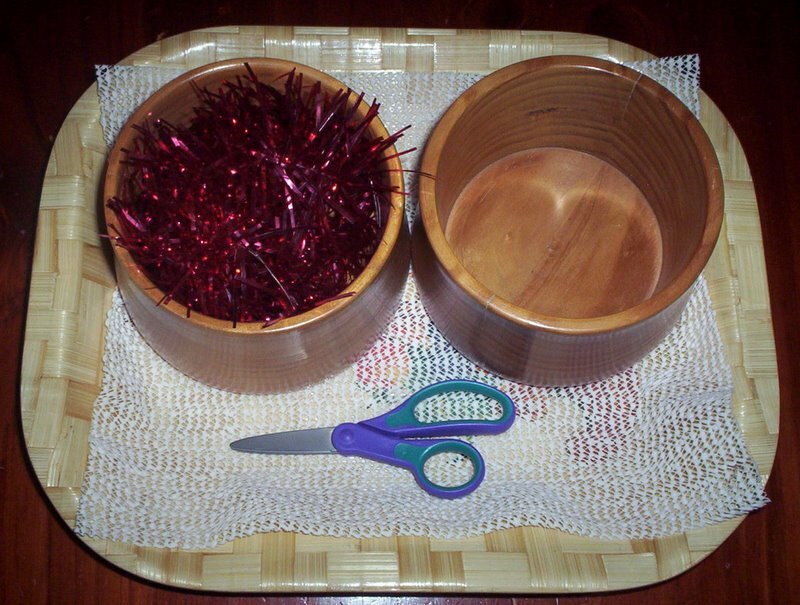 Tinsel makes pretty off-cuts for craft projects. It is quite difficult to handle for beginner cutters though. 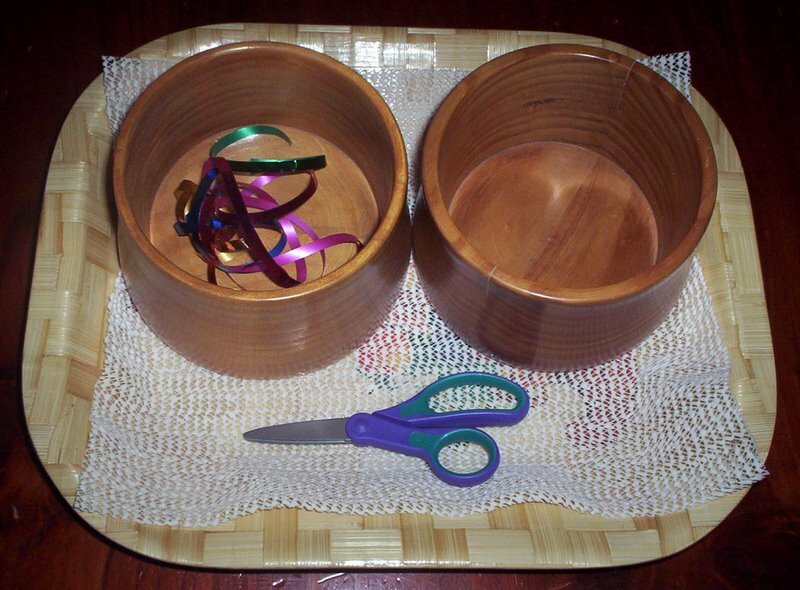 I usually set my cutting activities up in the same format (same tray with basket or two wooden bowls) so that once familiar with the task, there is no need to re-explain what to do when a new material is introduced. 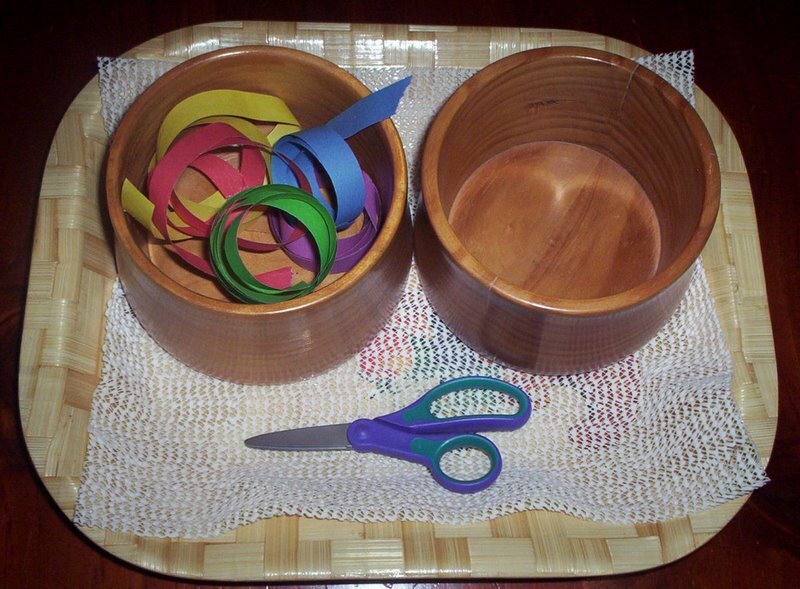 Scraps are caught in the empty bowl or basket and can be collected and used for art activities such as gluing or collage. Curling ribbon is also quite difficult to cut because it curls! Add snippets to your collage or other crafty supplies. When the first cutting experience is presented I demonstrate first, explain what they need to do, then supervise very closely for a time, until I am sure that the child has mastered holding the scissors correctly, points them away from their body, moves their holding hand while cutting, collects their scraps in the container provided and is generally using the scissors in a responsible manner. I am then able to relax my supervision a little and begin to vary the materials once interest in those already available is beginning to wane. The photographs throughout this article are in a suggested order of difficulty. Stick with thin card strips until the skill is well mastered, moving to thin card strips with straight and diagonal lines to cut along, before introducing the other suggested materials. Moving too fast will simply result in frustration as the material proves too difficult for the child to manipulate and cut successfully. Other items (such as the animals pictured below) can be added to keep interest levels high. Following on from here, a variety of interesting papers, shapes and other materials can be presented, including those that require the child to slide the scissors along and make several cuts. Start with free cutting, straight lines, then curves and other shapes.